Tas: Why not at b here? Like the usual san-san joseki. 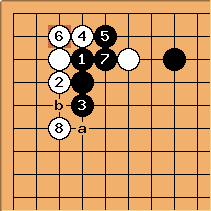 How does the aditional white stone prevent that black hane? Tas: Oh sorry,that is allready answered on the page. I should read more carefully before posting. Sorry.